Cost: $30 gets you registered for two days of demo or $20 for one day. Every registration includes a 1 year subscription to SKImag. 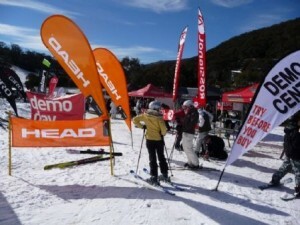 Test drive the top of the line new seasons skis and snowboards in Thredbo. The theory is simple, just turn up on the day, grab a lift pass, pay $30 and then demo as many skis and boards as you like all day. The setup is slopeside at the base of the Kosciuszko Express so think of it as a Grand Prix pit stop and the company reps as your pit crew. Guests are reminded they need a valid driver’s licence as well as a credit card to register.